Unlike typical thin & runny stains, WEATHERSEAL is thick and rich making it easy to apply without the mess. Formulated especially for log homes and cabins, WEATHERSEAL can be used over ALL types of outdoor wood surfaces including log homes, wood fences, wood shake siding, and pressure-treated, anywhere where a beautiful natural wood appearance is desired. 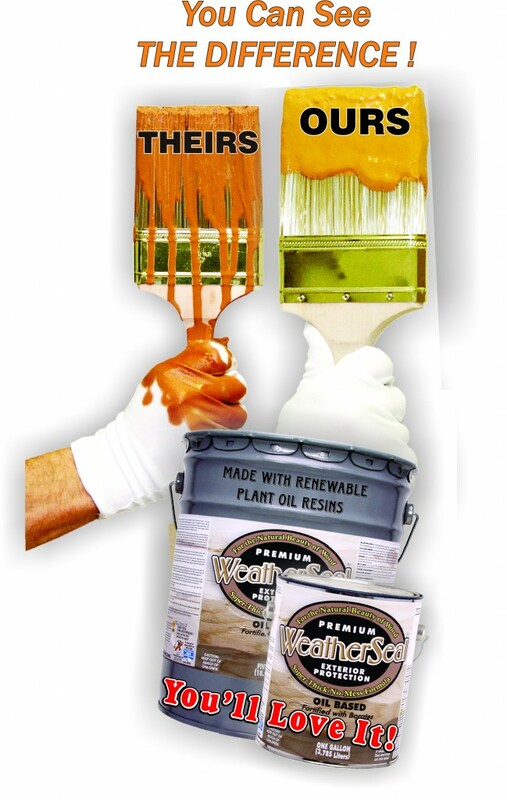 It�s a stain applicator�s dream: it goes on creamy smooth, there�s no pigment settling, and it absorbs into the wood like a much thinner stain. With its thick consistency, you get more WEATHERSEAL protection per brush stroke because more stain can be deposited on a vertical surface without dripping off. WATHERSEAL is best applied with a roller or brush. Spraying is also an option with this product. Coverage: 250-400 sq. ft. per gal. We have been using Weatherseal on logs for over 24 years. It is the only stain we recommend to our customers.